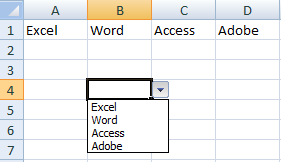 This is just a basic article to illustrate how to insert a drop-down list in excel worksheet. In Microsoft Office 2007 it is not very difficult once we are used to it. Step 3: From the allow list Select the List Value, also make sure you have the In-cell dropdown selected or Excel does not generate the dropdown list. 1) Directly specify the data in Source field. 2) Click the Source control and drag to highlight the cells that have the data you want. Step 4: click ok and you can find your drop box in the cell you specified the validation. You can add the drop-down list to multiple cells. 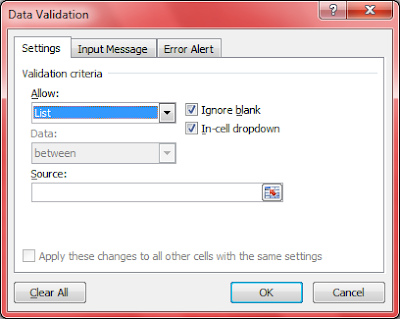 Select the range of data input cells instead of a single cell. It even works for non-contiguous cells. Hold down the Shift key while you click the appropriate cells.